Copyright ©2008 The WJG Press and Baishideng. All rights reserved. Author contributions: Oki M and Yamamoto H contributed equally to this paper and designed research; Oki M, Yamamoto H, Taniguchi H, and Adachi Y performed research; Oki M, Taniguchi H, Yamamoto H, Imai K, and Shinomura Y analyzed data; and Oki M, Yamamoto H, and Shinomura Y wrote the paper. AIM: To clarify the expression and role of Ephrin receptor A4 (EphA4) in gastric cancer in relation to clinicopathological characteristics and the expression of fibroblast growth factor receptor 1 (FGFR1) and ephrin ligands. METHODS: Eleven gastric carcinoma cell lines, 24 paired surgical fresh specimens of gastric adenocarcinoma and adjacent nontumor tissue, 74 conventional formalin-fixed, paraffin-embedded tumor specimens, and 55 specimens spotted on tissue microarray (TMA) were analyzed. Reverse transcription-PCR (RT-PCR), real-time RT-PCR, immunohistochemistry, and cell growth assays were performed. RESULTS: Overexpression of EphA4 mRNA expression was observed in 8 (73%) of 11 gastric cancer cell lines and 10 (42%) of 24 gastric cancer tissues. Overexpression of EphA4, analyzed by immunohistochemistry, was observed in 62 (48%) of 129 gastric cancer tissues. EphA4 overexpression, at the protein level, was significantly associated with depth of invasion and recurrence. EphA4 overexpression was also correlated with FGFR1 overexpression. Patients with EphA4-positive cancer had significantly shorter overall survival periods than did those with EphA4-negative cancer (P = 0.0008). The mRNAs for ephrin ligands were coexpressed in various combinations in gastric cancer cell lines and cancer tissues. Downregulation of EphA4 expression by siRNA in EphA4-overexpressing gastric cancer cell lines resulted in a significant decrease in cell growth. CONCLUSION: Our results suggest that overexpression of EphA4 plays a role in gastric cancer. Figure 1 RT-PCR analysis of the EphA4 and FGFR1 in gastric cancer cell lines. Figure 2 Real time RT-PCR (A) and semiquantitative RT-PCR (B) analysis of the EphA4 in gastric cancer tissues. A: From left to right; case 1 tumor, case 2 tumor, case 3 tumor, case 4 tumor, case 3 normal, case 1 normal, and case 2 normal; B: N and T = matched samples from non-tumor and tumor tissue, respectively. Figure 3 Immunohistochemistry for EphA4 in gastric cancer tissues (× 200). A: Well differentiated gastric cancer negative for EphA4; B: Poorly differentiated gastric cancer negative for EphA4; C: Normal gastric epithelia negative for EphA4; D: Moderately differentiated gastric cancer positively stained for EphA4; E: Poorly differentiated gastric cancer positively stained for EphA4. Figure 4 Kaplan-Meier survival curves of patients with gastric cancer according to the expression of EphA4 (P = 0. 0008). Figure 5 RT-PCR analysis of the type A ephrins and type B ephrins in gastric cancer cell lines. 1: NUGC3; 2: NUGC4; 3: SNU1; 4: SNU638; 5: MKN28; 6: MKN45; 7: MKN74; 8: KATOIII; 9: HGC27; 10: GC1Y; 11: AZ521. Gastric cancer is the fourth most common cancer and the second leading cause of cancer-related death in the world. Genetic and epigenetic alterations play important roles in the development and progression of gastric cancer[1,2]. Considerable attention has been given to the potential role of tyrosine kinases in gastric cancer[3-6]. The Ephrin (Eph) receptors constitute the largest family of tyrosine kinase receptors[7-10]. The Eph receptors interact with a second family of cell surface-anchored ligands, ephrins. The Eph receptors and ephrin ligands are divided into the two subclasses, A and B. Type A ephrins and type B ephrins are attached to the plasma membrane via glycosyl phosphatidyl inositol linkages and transmembrane sequences, respectively. Eight EphA receptors (EphA1-A8), five EphB receptors (EphB1-B4, B6), five type A ephrins (EphfrinA1-A5), and three type B ephrins (ephrinB1-3) are known in the human genome. EphA receptors usually bind to type A ephrins and EphB receptors binds to type B ephrins. The combinations for the Eph receptors and ephrin ligands are considered to occur in a tissue-type and/or cancer-type specific manner[7-10]. The potential role of Eph receptor and ephrin ligand family in human cancer is receiving increasing attention. Altered expression patterns of Eph/ephrin have been correlated with tumor behavior, such as invasiveness, vascularization, metastatic potential, and patients' prognosis[7-10]. Generally, the upregulation of Eph/ephrin has been reported in various types of cancer[7-10]. Overexpression of EphB2, ephrinB1, EphA2, and ephrinA1 has been reported in gastric cancer[11-13]. On the other hand, the concept that Eph receptors are oncogenes needs a new look on the basis of recent findings of downregulation of Eph receptors in certain types of cancer[14-17]. However, because functions of Eph receptors can overlap, loss of one receptor can be partially compensated for by other Eph receptors that have similar ligand-binding specificities and expression patterns. Thus, it seems important to characterize the role of Eph/ephrin with specific characteristics. In this regard, EphA4 is an engaging target for research. Compared with other Eph receptors, EphA4 is distinguished by its ability to bind to both type A ephrins and most type B ephrins[7-10]. Indeed, overexpression of EphA4 has been recently reported in human prostate and pancreatic cancers[18,19]. Moreover, it has been reported that EphA4 forms a hetero receptor complex with fibroblast growth factor receptor (FGFR) 1 and that EphA4/FGFR1 complex potentiates FGFR-mediated downstream signal transduction. It is well known that FGFR signal pathway plays important roles in gastric cancer[20,21]. Thus, it seems important to clarify the relevance of EphA4 in gastric cancer. Using reverse transcription-PCR (RT-PCR), real-time RT-PCR, immunohistochemistry, and cell growth assays, we analyzed the expression and role of EphA4 in gastric cancer, in relation to clinicopathological characteristics and the expression of FGFR1 and ephrin ligands. Gastric carcinoma cell lines, NUGC3, NUGC4, SNU1, SNU638, MKN28, MKN45, MKN74, KATOIII, HGC27, GC1Y, and AZ521 were purchased from the Japanese Cancer Research Resources Bank (Tokyo, Japan), Riken Cell Bank (Tokyo), or the American Type Culture Collection (Rockville, MD), and were grown in Dulbecco's modified Eagle's medium or RPMI1640 supplemented with 10% fetal bovine serum (Cansera, Ontario, Canada). Cells were maintained at 37°C in an atmosphere of humidified air with 5% CO2. 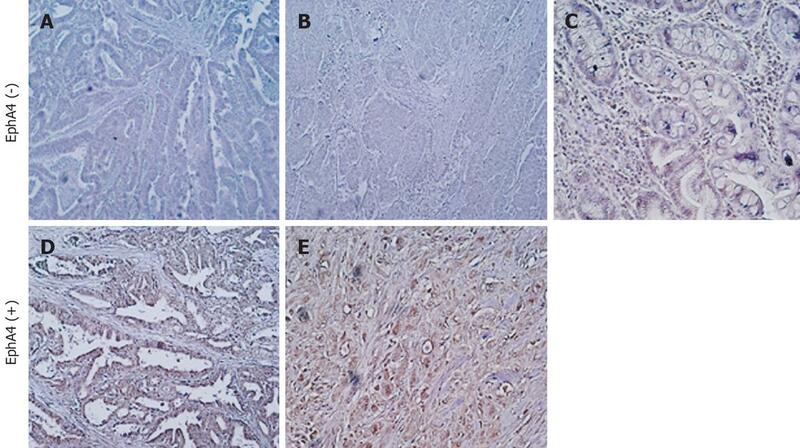 Twenty-four paired surgical fresh specimens of Japanese gastric adenocarcinoma and adjacent nontumor tissue and 74 formalin-fixed, paraffin-embedded tumor specimens were obtained from Japanese patients who had undergone surgical treatment. pTNM stages were as follows: 14 stageIcancers; 24 stage II cancers, 33 stage III cancers, and 3 stage IV cancers. No patients received chemotherapy or radiation therapy before surgery. No patients received adjuvant treatment until diagnosis of the recurrence of cancer. Recurrent patients received chemotherapy (fluorouracil, S-1, or S-1/cisplatin). An analysis of the effect of chemotherapy for recurrent patients showed no significant effect on survival in this study (data not shown). Tissue microarray (TMA) of Korean gastric cancer tissues was purchased from SuperBioChips Laboratories (Seoul, Korea). pTNM stages were as follows: 23 stageIcancers, 13 stage II cancers, 9 stage III cancers, and 10 stage IV cancers. Each fresh tissue specimen was divided into two pieces after resection. For total RNA extraction, one sample was immediately frozen in liquid nitrogen at the time of surgery and stored at -80°C until extraction. The other sample was processed for pathological examination using hematoxylin and eosin staining for the evaluation of the tumor cell content. Only specimens containing more than 80% tumor cells were used for analysis. The tumor-node-metastasis (TNM) system of the American Joint Committee on Cancer and the International Union against Cancer was used for the pathologic diagnosis and classification of variables. Informed consent was obtained from each patient. Semiquantitative RT-PCR was done as described previously. Briefly, total RNA was extracted from cancer cell lines and tissue specimens using Trizol reagent (Invitrogen, Carlsbad, CA, USA) according to the manufacturers' instructions. Extracted RNA was treated with DNaseI(Roche, Mannheim, Germany) and reverse-transcribed to cDNA using random hexamers with Superscript II reverse transcriptase (Invitrogen). 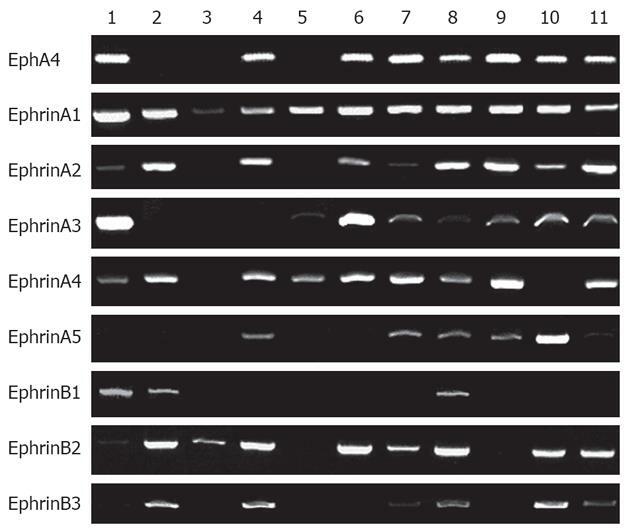 PCR amplification was performed with published PCR primers. The primer sequences used were 5'-CGTTATGTGGGAAGTGATGTCATA-3' and 5'-TTCCTCAATGGCTTTAATCACA TCT-3' for EphA4 and 5'-TCCTAGTGCCACAATCCCAGTCCT-3' and 5'-AGGGCATTAGAGGCCCAGAGA-3' for FGFR1. The other primer sequences were provided by Dr. Nakagawa. Glyceraldehyde-3-phosphate dehydrogenase (GAPDH) served as an internal control of the reaction. Standard curves for semiquantitative RT-PCR were drawn as described previously. PCR products were resolved on 2.5% agarose gels and signal intensities were quantified using a computer imaging system. All reactions were controlled without reverse transcriptase. The levels of gene transcripts were quantified as the ratio of the intensity of the target gene to the intensity of GAPDH. Overexpression was judged when the target gene expression in the tumor sample was at least 3 times higher than that in the corresponding normal sample. In cases without target gene expression in the corresponding normal sample, overexpression was judged when the target gene expression in the tumor sample was at least 3 times higher than the highest ratio among the 24 normal samples analyzed. Downexpression was judged in a reversed way. Real-time RT-PCR for EphA4 was done by using TaqMan real-time PCR system as described previously. The amount of EphA4 mRNA was displayed as the x-fold gene expression compared with the corresponding normal tissue. Five mm-thick sections of formalin-fixed and paraffin-embedded tissue and TMA were dewaxed in xylene and rehydrated in alcohol. The sections were then heated to 105°C in target retrieval solution (DakoCytomation, Carpinteria, CA) in an autoclave for 10 min for antigen retrieval. Endogenous peroxidase activity was suppressed using a solution of 3% hydrogen peroxide in methanol for 5 min. After being rinsed twice in phosphate-buffered saline (PBS), the sections were incubated for 18 h at 4°C with a rabbit anti-EphA4 polyclonal antibody (Santa Cruz, CA, USA) or a mouse anti-FGFR1 monoclonal antibody (Abcam, Cambridge, UK). The antibodies were diluted in antibody diluent with background reducing components (0.05 mol/L Tris-HCl buffer containing 0.1% Tween and 0.015 mol/L sodium azide, DakoCytomation). Normal rabbit or mouse immunoglobulins were substituted for each primary antibody as negative controls. After washing 3 times in PBS, the sections were treated with biotinylated goat anti-rabbit or anti-mouse immunoglobulin (DakoCytomation) for 10 min and then with horseradish peroxidase-avidin complex, diluted as recommended by the manufacturer, for 10 min. The slides were then washed in PBS and developed in 0.05 mol/L Tris-HCl (pH 7.5) containing 0.6 mg/mL 3-3' diaminobenzidine at room temperature. The sections were counterstained in Mayer's hematoxylin and mounted. siRNAs for EphA4 mRNA (Silencer® Pre-designed siRNA) were purchased from Ambion (Austiin, TX). Unrelated nonspecific siRNAs (Silencer® Negative Control siRNA) were used as control. siRNA transfection was performed following manufacturers' instructions. After incubation for 72 h, siRNA-transfected SNU638 and AZ521 cells were analyzed by RT-PCR to validate knockdown effect on EphA4. These cells were used for cell growth assay. Tumor cell growth assay was done using the tetrazolium compound WST-8 (Cell Counting Kit-8; Dojindo Laboratories, Kumamoto, Japan). The results were assessed for associations with clinico-pathological parameters using the following statistical tests: Student's t test for age, the Mann-Whitney test for depth of invasion, lymph node metastasis, and pTNM stage, and the Chi-square test or Fisher's exact test for the remaining parameters. Survival analysis was carried out for 71 patients (pTNM stages were as follows: 14 stageIcancers; 24 stage II cancers and 33 stage III cancers). Since information on preoperative and postoperative treatment was not available for 55 specimens spotted on TMA, these patients were not involved in survival analysis. Cumulative survival rates were calculated by the Kaplan-Meier method. The difference between survival curves was analyzed by the logrank test. Multivariate analysis was performed using Cox's proportional hazard model. A P value of less than 0.05 was considered significant. Expression of EphA4 mRNA was analyzed in 11 gastric cancer cell lines by RT-PCR. EphA4 expression was detected in 8 (73%) of 11 gastric cancer cell lines (Figure 1). There was no correlation between EphA4 positivity and histopathology. Expression of FGFR1 mRNA was detected in 8 (73%) of 11 gastric cancer cell lines (Figure 1). Expression levels of FGFR1 were low in SNU1, MKN28, GC1Y, and AZ521. There was no correlation between FGFR1 positivity and histopathology. Five of 11 gastric cancer cell lines expressed both EphA4 and FGFR1. Expression of EphA4 mRNA was analyzed in 4 paired gastric cancer and corresponding normal tissues by both real-time RT-PCR and semiquantitative RT-PCR. The mRNA expression of EphA4, analyzed by real-time RT-PCR, was upregulated in cancer tissues compared with normal tissues (Figure 2A). Concordant results were obtained by semiquantitative RT-PCR (data not shown). Therefore, expression of EphA4 mRNA was further analyzed in 20 paired gastric cancer and corresponding normal tissues by semiquantitative RT-PCR. In 10 (42%) of total 24 cases, the mRNA expression of EphA4 was upregulated in cancer tissues compared with normal tissues (Figure 2B). Similarly, in 12 (50%) of 24 cases, the mRNA expression of FGFR1 was upregulated in cancer tissues compared with normal tissues (Figure 2B). Overexpression of EphA4 was significantly correlated with FGFR1 overexpression (P < 0.01; data not shown). Figure 3 shows representative results of immuno-histochemistry for EphA4 in gastric cancer tissues. The EphA4 protein was strongly expressed in the cytoplasm and/or membrane of cancer cells, whereas normal gastric epithelium from the same patient showed no, or very weak, expression of EphA4 protein. There was no detectable immunoreactivity with the control normal rabbit immunoglobulins (data not shown). EphA4 expression was positive in 62 (48%) of the 129 cases. EphA4 overexpression was confirmed in those cases in which EphA4 mRNA overexpression was shown by using RT-PCR. The relationship between EphA4 positivity and clinicopathological characteristics was then analyzed. EphA4 positivity was significantly associated with depth of invasion and recurrence. Moreover, patients with EphA4-positive cancer had significantly shorter overall survival periods than did those with EphA4-negative cancer (P = 0.0008, Figure 4). Multivariate analysis, including EphA4 expression, depth of invasion, lymph node metastasis, and vascular invasion, showed that EphA4 expression was an independent marker of poor survival for gastric cancer (relative risk 2.1, 95% confidence interval 1.0-4.2, P = 0.038). Immunohistochemistry for FGFR1 was done in 55 gastric cancer samples spotted on TMA and six conventional sections of gastric cancer. FGFR1 protein was strongly expressed in the cytoplasm and/or membrane of cancer cells, whereas normal gastric epithelium from the same patient showed no, or very weak, expression of FGFR1 protein. FGFR1 protein was overexpressed in 37 (61%) of 61 gastric cancer specimens. There was no significant correlation between FGFR1 expression and clinicopathological characteristics. FGFR1 expression was significantly correlated with EphA4 expression (P = 0.009). Expression of ephrin A1-A5 and ephrin B1-B3 mRNA was analyzed in 11 gastric cancer cell lines by RT-PCR. The extent of expression of each gene was considerably differed among the cell lines (Figure 5). Expression of ephrin A2 was relatively concordant with that of EphA4. The relative amounts of the transcripts of ephrin ligands also varied considerably among tumor tissue samples. None of the expression of ephrin ligands was clearly concordant with that of EphA4 (data not shown). Cell growth assay after treatment with specific siRNA for EphA4 gene was done to assess the role of EphA4 expression in gastric cancer cells. Transfection with siRNA resulted in over 80% inhibition of mRNA expression (data not shown). Transfection with EphA4-specific siRNA significantly suppressed cell growth of SNU638 and AZ521cells compared with control siRNA-transfected counterparts (P = 0.008; data not shown). In this study, we found overexpression of EphA4 mRNA in gastric cancer cell lines and cancer tissues. Previous microarray and Northern blot analyses have shown that EphA4 expression in normal adult tissues is very restricted. Moreover, overexpression of EphA4 in gastric cancer was observed at the protein level as analyzed by immunohistochemistry and this correlated with depth of invasion. These results suggest that EphA4 plays a role in gastric cancer. The implication of EphA4 expression in gastric cancer was further substantiated by its correlation with recurrence and short overall survival time. Moreover, EphA4 expression provided significant predictive value for overall survival in the multivariate analysis, suggesting that EphA4 expression could be a useful predictor of recurrence and poor prognosis. Prognostic significance of EphA4 expression has not previously reported in human cancer. Moreover, EphA4 is the first Eph/ephrin family member of which prognostic significance was shown in gastric cancer. It has been reported that EphA4 forms a hetero receptor complex with FGFR1 and that the EphA4/FGFR1 complex potentiates FGFR-mediated downstream signal transduction. Since FGF/FGFR signal pathway has been reported to play an important role in gastric cancer[20,21], we analyzed the relationship of EphA4 expression with FGFR1 expression. The frequency of FGFR1 overexpression in this study was consistent with the frequencies reported previously. FGFR1 expression was correlated with EphA4 expression. Therefore, EphA4 may play a role in gastric cancer, at least in part, through the interaction with FGFR signaling. EphA4 has also been shown to phosphorylate FGFR2 and 3. Overexpression of mRNA for FGFR-2 and FGFR-4 has been reported in gastric cancer. Further analysis is necessary to clarify the relationship between EphA4 and FGF/FGFR signaling pathway in gastric cancer. To search for potential candidate ligands for the EphA4 receptor in gastric cancer cells, we examined the expression patterns of members in the type A and type B ephrin ligand families by semiquantitative RT-PCR. The mRNAs of ephrin ligands were coexpressed in various combinations in gastric cancer cell lines and cancer tissues. Expression of ephrinA2 was relatively concordant with that of EphA4 in gastric cancer cell lines. However, expression of ephrin ligands was not clearly concordant with that of EphA4 in cancer tissue samples. On the other hand, coexpression of ephrinA3 and EphA4 has been reported to play an important role in pancreatic cancer. These results further support the notion that combinations for the Eph receptors and ephrin ligands depend on tissue-type and/or cancer-type[7-10]. Moreover, the interaction of EphA4 expressed on gastric cancer cells and ephrin ligands expressed on nontumour cells, such as mesenchymal cells and vascular cells, could play a role in gastric cancer through the interaction between these cells. Further studies are necessary to clarify these issues. By using the small interfering RNA strategy, we investigated whether EphA4 expression was associated with growth of gastric cancer cells. Downregulation of EphA4 expression in gastric cancer cells resulted in a reduction in cell viability, suggesting that the overexpression of EphA4 plays a role in gastric cancer cell growth. Taken together, these results suggest that EphA4 overexpression plays a role in gastric cancer. As a target gene for molecular therapy, its expression in normal adult tissues is important. Although EphA4 was found to be highly expressed in the adult brain, it has been thought that therapeutic antibody targeting membrane molecules could not pass through the blood brain barrier and were unlikely to affect the central nervous system. Considering the expression pattern of EphA4 together with its oncogenic function, EphA4 could be a target for molecular therapy by a therapeutic antibody and/or by small molecule approach targeting its kinase activities. The Ephrin (Eph) receptors constitute the largest family of tyrosine kinase receptors. EphA4 is distinguished by its ability to bind to both type A ephrins and most type B ephrins. It has been reported that EphA4 forms a hetero receptor complex with fibroblast growth factor receptor (FGFR) 1 and that the EphA4/FGFR1 complex potentiates FGFR-mediated downstream signal transduction. The potential role of Eph receptor and ephrin ligand family in human cancer is receiving increasing attention. Altered expression patterns of Eph/ephrin have been correlated with tumor behavior, such as invasiveness, vascularization, metastatic potential, and patients’ prognosis. Generally, the upregulation of Eph/ephrin has been reported in various types of cancer. The expression profiles of EphA4, FGFR1, and ephrins were systematically analyzed in gastric cancer cell lines and/or tissues by using RT-PCR, immunohistochemistry, and tissue microarray analysis. This study demonstrated that overexpression of EphA4 and FGFR1 may be involved in gastric tumorigenesis. 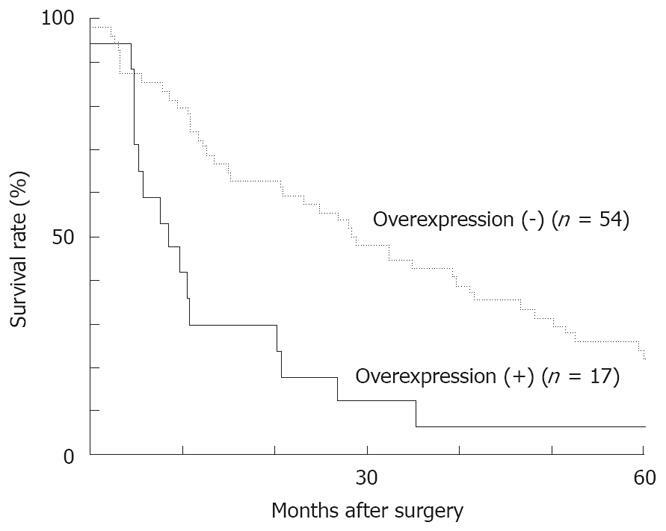 EphA4 overexpression could be a poor prognostic marker for gastric cancer. Ephrin receptor: The Ephrin receptors constitute the largest family of tyrosine kinase receptors. The Eph receptors interact with a second family of cell surface-anchored ligands, ephrins. Eight EphA receptors (EphA1-A8) and five EphB receptors (EphB1-B4, B6) are known in the human genome. Ephrin: The ephrins are divided into the two subclasses, A and B. Type A ephrins and type B ephrins are attached to plasma membrane via glycosyl phosphatidyl inositol linkages and transmembrane sequences, respectively. Five type A ephrins (Ephrin A1-A5) and three type B ephrins (Ephrin B1-B3) are known in the human genome. This paper studied expression of EphA4 and FGFR1 in gastric cancer. The authors showed that overexpression of EphA4 is a frequent feature in cell lines (73%) and less common in gastric cancer samples (around 40%-50%). They show a correlation between the expression of such molecular aspect and shorter survival. This study has the potential to become interesting to the scientific community.